Toyota Lanka Ltd., the sole authorised distributor for Toyota vehicles in Sri Lanka recently had a team of high-profile visitors from its parent company visit Sri Lanka to assess the market potential. Jun Karube, the Chairman of the Board at Toyota Tsusho Corporation, Japan and President of Toyota Tsusho Asia Pacific Ltd. (TTAP), Singapore Hideki Yanase were among this group. Non-automotive businesses like metals, infrastructure, chemicals, food, machinery and energy. Since 2010 the company expanded the scope and honed the capabilities of existing businesses while accelerating investments in new business fields, such as Bluefin tuna aquaculture and overseas hospital management. TTC has also expanded to over 120 countries, 150 offices and 900 subsidiaries and affiliates around the world. Jun Karube has been the Chairman of the Board at TTC since April 2018 and was previously the President and Chief Executive Officer. With a long standing career at TTC, he was also previously the Deputy Chief Division Officer of Global Strategic Integration, Deputy Chief Division Officer of Machinery and Electronics and the Chief Division Officer of Global Strategic Integration. Meanwhile, Hideki Yanase serves as the president of TTAP. He was earlier the Managing Director and Chief Division Officer of Administration. He joined TTC in 1979 and hold a degree in Metallic Engineering. 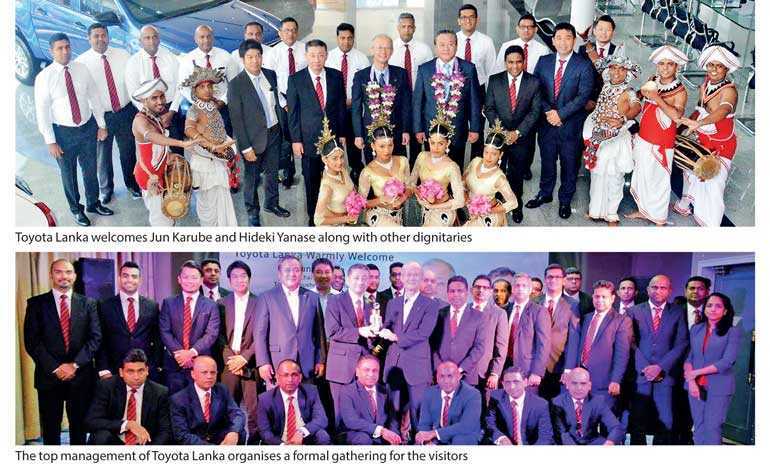 The two gentlemen along with their teams visited the Toyota Lanka Head Office in Wattala and also the two branch offices in Ratmalana and Negombo during their visit. They also visited the Colombo Dockyard to discuss the progress of the Colombo Dockyard Project where two vessels, the Pilot Station Vessel and Buoy Tender Vessel to be used in Iraq are being built on behalf of TTC. This project alone is bringing in an investment of Rs. 8 billion to Sri Lanka. In their itinerary was also visits to supermarkets, department stores and shopping malls to assess the market potential for future projects and investments in Sri Lanka. “Toyota Lanka despite being operated in a small island like Sri Lanka has set a benchmark through the processes and business models they have followed. Their model is now taken as an example around the world to be used as a pathway for betterment of businesses. Toyota Lanka has made sure to go to the customer when and where needed and are located in some of the main cities around Sri Lanka that cover all Toyota vehicle needs; Sales, After Sales Service and Spare Parts. Sri Lanka can be proud of their efforts,” Jun Karube said during his visit. During their visit to Toyota Plaza in Wattala, Karube and Yanase also declared open the “Rush” Cinema Lounge, the “Supra” Game Zone and Café Mirai by Momo at the premises. These recreational areas are a value addition to all Toyota customers to increase customer satisfaction. Toyota Lanka has won many accolades for its superior customer service including the Customer Service Excellence Gold Award for six consecutive years and the most prestigious Leadership award in the last year. These facilities and fun zones are a further step to enhance customer experience every time they visit Toyota Plaza. For more information please contact Toyota Lanka on 0112 939000.